InstaNatural’s Retinol Moisturizer uses the power of Vitamin A (Retinol), Vitamin C, and Green Tea to provide intense antioxidant benefits for beautiful skin and optimal results. This makes it the perfect cream to achieve radiant, soft and refreshed skin. Vitamin A and Vitamin C are two of the most trusted ingredients to fight aging concerns. Powered with the additional antioxidant benefits of Green Tea, this moisturizer offers strong antioxidant power to fight against the signs of aging. These nutrients work synergistically to repair and reduce the effects of sun exposure and other aggressors that damage the skin. Vitamin A is known to help decrease blemishes and promote clear skin. By removing dead skin and unclogging pores, this Retinol Moisturizer can help control breakouts so you can achieve a clearer, smoother, and more flawless complexion. 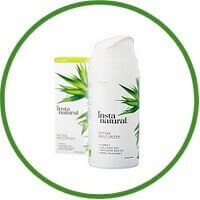 InstaNatural’s Retinol Moisturizer formula contains a creamy blend of nourishing ingredients, such as Jojoba Oil, Hyaluronic Acid, and Shea Butter, which keeps skin looking hydrated and smooth. With just one use, your skin will feel soft and supple throughout the day. This Retinol Moisturizer is great for a wide variety of skin types, which makes it a fantastic addition to any skincare regimen. Use of this Retinol Moisturizer at night onto cleansed skin is recommended, using any applicable serums first.